And now the Milliennial discussion takes a very hard and very dark turn … and leads us down a path toward a subject impacting nearly every sector of healthcare: the opioid crisis. US life expectancy is on the decline for the first time in decades. While we seem to be putting on a good show of getting healthier (protein shakes, work out clubs, organic produce sections, and diet mocktails flood our social media news feeds), these dark-and-getting-darker statistics should shake us to our “take-your-calcium-with-magnesium” infused bones. The upswing at the right side of the chart scarily does not appear to have a slowing or plateau in sight. This “change-making” of the life expectancy rate is occurring primarily because of the soaring death rates of one generation particularly. You guessed it: Millennials. While death rates for older generations are decreasing, according to the US Centers for Disease Control (CDC), death rates for those aged 25 – 34 rose 20.5% between 2015 and 2016. From running out of space at morgues (Ohio) to skyrocketing costs of the transportation of corpses (West Virginia), states are scrambling to get a grasp on the opioid crisis from every level. Each and every death represents more than one victim and one body – it reveals an entire family in need of emotional and physical help. 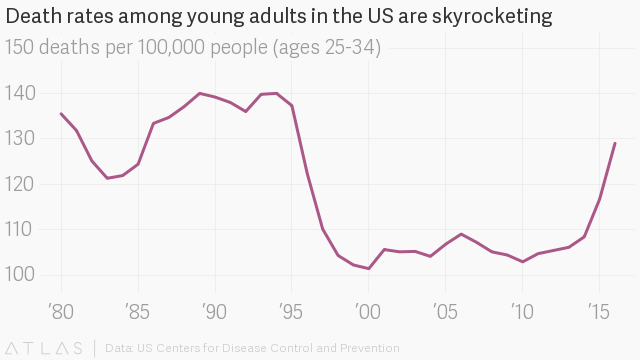 Thus, the catastrophic effects of opioid misuse are exponential. The subsequent burden on behavioral health and public health is crushing. At Patagonia Health we agree. So, while it’s not light and happy, we’re facing the dark side of the opioid crisis. We want to join our customers (and future customers) in walking and wrestling through the statistics. We know the statistics are more than numbers: they are the people and families you serve each and every day. They are why you do your jobs. Therefore, you are why WE do ours.